Rt Ch Reveirter Loch Fyntalloch, Fyn was born on 23 October 2008. Fyn has now turned eight and has been retired from retrieving trials. Fyn commenced her trial career in a blaze of glory gaining seven wins and one placing from her first ten starts in trials and gaining the title of Restricted Retrieving Dog (RRD). Fyn’s trial career commenced winning a Beginners Test conducted by the Victorian German Shorthaired Pointer Club at Sale on 24 January 2010. By the 18 July 2010 Fyn had won her way through Novice Stakes and Restricted Stakes and gained her RRD title after six months of trialling. Being so young Fyn was then rested from trials to gain more skills prior to progressing to All Age Stake level. By the end of 2011 Fyn had competed in 12 All Age Stakes and one Championship Stake to complete five stakes and gain three minor placings. Fyn’s trial career was interrupted to perform maternal duties on two occasions. 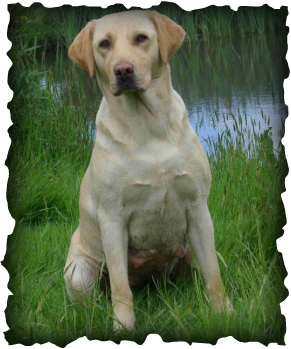 From her first litter at the end of 2010 Fyn had 11 pups and again at the end of 2011 Fyn had a second litter of 11 pups. Fyn gained the first six points towards her championship title by finishing second in the Tasmanian Retrieving Trial Championship in 2012. Fyn went on to gain her Retrieving Trial Champion Title by winning at All Age at the South Australian Labrador Retriever Club Tolderol Cup Weekend on 8 June 2015. Despite being one of the best dogs we have had at basic obedience around the house, yard and at training when you got to a trial Fyn’s exuberance would take over and she would forget what she had to do around the pegs and loose excessive points. In fact she would have had better placings at both All Age and Championship level if she hadn’t lost so many points around the pegs. Fyn went on the eventually place a total of 17 times in All Age stakes and twice in Championship stakes until she was retired from trialling at the end of 2015. Fyn is now to embark on a new career working with children with a range of disabilities at schools for the disabled. Fyn has gone through a training period over the last two years in gaining exposure to and supporting children with disabilities.